In many regions of Uganda, rural women live below the poverty line, and food scarcity means these women must work on farms simply to keep enough food on the table to feed their families. Action for Rural Women’s Empowerment (ARUWE) began in 2000 in Kampala, Uganda, to address the needs of rural women and support them in achieving economic empowerment. The organization offered courses to rural women about food security, income generation, health, literacy, and more—critical issues for women in the region, who had few resources available to them. “The rural women had issues that were inhibiting them from actively participating in their social development,” says Agnes Mirembe, Action for Rural Women’s Empowerment’s current Programs Manager. But when the organization began, it had little funding and no international support. In fact, for several years the staff consisted mostly of volunteers. In 2004, the organization received its first grant from Global Fund for Women for $8,000—one of the first from international funders. A few years later, Global Fund for Women awarded the group a second grant for $13,000—the largest grant they had ever received. Besides providing critical financial support, this grant from Global Fund for Women was pivotal in helping the organization win additional support from other funders. “We are proud to say Global Fund for Women was our biggest donor at the time, and so, other partners came on board, trusting us because Global Fund for Women was recommending us and telling them about our good work,” says Agnes. In addition to offering trainings on organic sustainability farming and business management, ARUWE teaches the rural women it works with about their rights. The organization teaches women about their health, land, and economic rights and focuses on women and children’s socio-economic empowerment. They also run election exercises and leadership trainings so the women know how to vote in elections and can participate in local councils. Whereas before, many of the women were living below the poverty line, now they have sustainable year-round income. They use their earnings to send all of their children to school and provide for their families. When the group first began, they worked only in one small rural area in Uganda. Now, ARUWE helps many communities within the central and north-eastern regions of Uganda with the goal to serve women in the east African region as a whole. Agnes says this growth is thanks in part to the support, capacity-building training, and partnership with Global Fund for Women. “We now believe in growing bigger to become a national organization,” she says. How did Global Fund for Women’s support help ARUWE grow? When we first started we had a few very small grants, but we did not have the capacity to do what we really wanted, because our funding could only reach just a few women at a time. We had plans, we had a simple strategy that we wanted to implement, but we weren’t in a position to. So when Global Fund for Women came in, we realized that it was the time to propel our work forward—$8,000 at that time was so much money because we were very small. Global Fund for Women also provided training for the staff. They helped us understand exactly how a project is supposed to be designed. Global Fund for Women taught us so much about the process. We learned and shared back and forth, because our partnership with Global Fund for Women is based on understanding, dialogues, and discussions. What is different about the way Global Fund for Women works? Global Fund for Women consults us to understand what’s on the ground. I think that’s something we think is very good and very engaging. And for us, Global Fund for Women has given us amazing opportunities in terms of capacity-building, in terms of training, which is very key. They have taught us about, for example, research and surveys and evaluation to show the impact of our work. 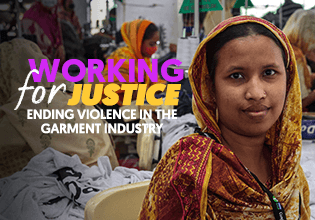 What has been the impact of working with Global Fund for Women? We believe this partnership between Global Fund for Women and ARUWE has really, really, really improved the livelihoods of the rural women, in terms of having sustainable food, having income for their families, knowing their rights. We hear all this in our beneficiary reports. That is at the community level. Now at the organizational level, this partnership is helping create leaders and build skills. I can give myself as a testimony. At the beginning I found it very hard to speak with confidence. After going to convenings and learning from our partners, we have been empowered with skills to communicate and articulate the outcomes and impact of our work. Before, the staff at ARUWE was very intimidated, myself included. But now our confidence has been boosted, and that has been really key. In what ways did Global Fund for Women help ARUWE’s involvement in the women’s movement? This partnership has built very good leadership, not only at the institutional level, but even in the communities. Some of the women we are working with have just finished voting election exercises, and we have two that are working on local level councils. There they can represent and talk about the issues that the women are really struggling with. It’s a beautiful thing to have leaders come out of the people that we are working with. We are so proud. From then on, she had one goal in mind: to help the women of Afghanistan. And while she began her journey alone, Global Fund for Women soon joined her as one of the very first supporters of her visionary work to bring education and opportunity to women in her country. Sakena attended university in the United States, earning BA and MPH degrees, and eventually returned to Pakistan (since Afghanistan was fighting the Soviet Union) to pursue her dream. She began in Pakistani refugee camps in 1992, where she saw that hundreds of young Afghanis had no opportunity to go to school. Sakena began teacher trainings in the camps and soon opened schools for refugees. In 1995 she founded the Afghan Institute of Learning—funded initially only by Sakena herself. Soon afterward, Sakena learned about Global Fund for Women and applied for a grant. Global Fund for Women became one of her first major international supporters at a time when she says it was “just me in a little room in Pakistan.” Global Fund for Women agreed with Sakena about the critical need for education for women and girls in the region and recognized her unique expertise, vision, and relationships. Since then, Sakena and Afghan Institute of Learning have gone on to make incredible gains for girls’ education in Afghanistan, and Sakena has received international recognition and acclaim. While supporting education and health programs in the refugee camps, AIL began supporting secret schools for girls while the country was under Taliban control. “When the Taliban were inside Afghanistan, people requested schools from me. I said, ‘How can I do that? It’s so dangerous.’ The system was so barbaric that right and left they were killing people, and they were not allowing women out of their house and definitely not to go to school,” says Sakena. But she soon had so many requests from Afghans that she decided to try, with the help of partners in Afghanistan who found safe locations for the schools in homes. Through Sakena and Afghan Institute of Learning’s work, 80 schools were set up, educating over 3,000 students. After the fall of the Taliban in 2002, AIL began operating openly in Afghanistan. Afghan Institute of Learning’s programs still focus on teacher training and education, but they also offer health training, legal aid, and operate 43 women’s learning centers, where women learn about political participation, healthcare, and more. Global Fund for Women’s more recent support has allowed Dr. Yacoobi and AIL to launch a radio station that will broadcast educational programs about basic health care and women’s human rights, as well as to train almost 1,500 teachers annually and continue support for learning centers. The organization’s programs now reach about 400,000 people a year. More than 70% of the beneficiaries are women and girls. They really believed in me. That really makes a huge difference. The way that they treated me, the way that they listened to me, the way that they really encouraged me, the way that they patted me on the shoulder [and said], ‘It’s OK. You will be able to do it.’ When you find that kind of encouragement, it means more than money. Did Global Fund for Women help you in ways besides financial support? They also introduced me to different organizations. Global Fund for Women is a big organization and has influence, so when they recommended me to other organizations, the other organizations were also interested in me. That really was a great help. Another way is that they invited me to their events and they made me a part of their organization. By seeing other people, and communicating with other organizations, you learn; for example, going to convenings [meetings with other organizations and activists]. This is something that is very important—giving some travel money… I was able to share my organization with others, and I was able to learn from others. What is the importance of an organization like Global Fund for Women? I really think that this organization is the most important organization in the world. Always, this has been my message, and it’s going to be my message. They don’t look at how big you are and how important you are and how famous you are. They treat you as a human being. You don’t feel small in front of them, in front of their staff. [Their staff] are the kind of people that really value you. This kind of attitude, it really helps. What else should people know about what makes Global Fund for Women unique? I think that people should realize that this organization really reaches out for the needy ones. For example, when I started my organization the women of Afghanistan were invisible… it was unknown for them to have an organization work with them. Global Fund for Women recognizes a developing country’s issues… When you work with grassroots people, you must come from the grassroots. You must have an understanding of it, and Global Fund for Women has that. A few years after founding Global Fund for Women, Anne Firth Murray wanted to carry forward her belief that women’s funds—organizations that work to mobilize more resources for grassroots women’s groups and empower women’s movements—should not exist exclusively within the United States. She was determined for other countries to have women’s grantmaking organizations like Global Fund for Women in order to grow the women’s movement and support a greater number of grassroots women’s organizations. She approached a group of bold women involved with human rights work in Mexico and invited them to visit Global Fund for Women in order to understand the model of a women’s fund. Shortly after visiting, these women began to conceive the idea of Sociedad Mexicana pro Derechos de la Mujer, now known as Semillas. In 1990, Semillas (which means “seeds” in Spanish) was founded. Emilienne also explains that, with Global Fund for Women’s support, Semillas was changing more than just the landscape for women’s organizations in Mexico—it was changing philanthropy altogether. After seeding its initial founding, Global Fund for Women funded Semillas through its first several years as the organization took root in Mexico and built its own network of donors and supporters. Once Semillas was well-established, Global Fund for Women supported Semillas in other ways, offering organizational advice and support through organizational transitions. Eventually Global Fund for Women and Semillas, with the leadership of the current Executive Director Laura Garcia, began working together as sister funds to do complementary and strategic grantmaking in the region. “Worldwide, there are very few organizations like Global Fund for Women who invest in setting up philanthropic institutions in the Global South. This is why Global Fund for Women made a revolutionary step in 1990 by investing in a long-term strategy to help create and sustain Semillas in its founding years,” explains Laura Garcia. “Twenty-five years later, Semillas stands as one of the strongest grantmaking institutions in Mexico, supported by more than 15 institutional donors yearly and 400 individual donors. Throughout its history, Semillas has proven to be a trailblazer in the women’s movement in Mexico. 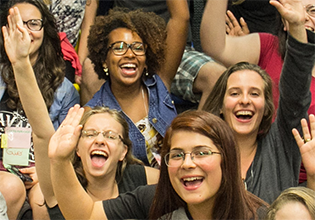 It has financed emerging organizations, of which some are today leading women’s rights organizations in the country. Did Global Fund for Women help Semillas in ways besides financial support? It was critical that Global Fund for Women opened the spaces in terms of supporting Semillas to come to conferences in the United States. We were able to learn from other women’s funds like Women’s Funding Network. I came from a Mexican environment, which is very different, so I learned a lot. Global Fund for Women grants to support travelling and learning in these spaces is unique. What do you think is the value of an organization like Global Fund for Women? In Uganda, rural women’s voices are often unheard and their needs left unmet. But Isis-WICCE—Isis-Women’s International Cross-Cultural Exchange—has been focused on amplifying the voices of women while emphasizing grassroots empowerment. Shortly after their founding, Isis-WICCE discovered a specific issue they wanted to help address: women were being intimidated by men in Uganda’s Internet cafés. While women were eager to learn about technology, the intimidation they experienced made them withdraw from even trying to learn. This inspired Isis-WICCE to pilot the innovative idea to start a women-only Internet café. That’s when Global Fund for Women got involved. Global Fund for Women listened to Isis-WICCE to hear just how technology could change Ugandan women’s lives, then gave the organization the financial support they needed. Isis-WICCE distributed multiple computers across three women’s groups in Uganda, effectively setting up women-only Internet cafés while allowing direct contact between women and helping women leaders’ voices be heard. Global Fund for Women also supported Isis-WICCE during a critical time when it was solidifying a new purpose in Uganda: giving voice to women in conflict settings. In 1995, the organization committed to seeking out women in remote, rural locations to document their experiences as a way of giving them voice. These women spoke about surviving conflict and other issues they were facing in their lives. The interviews were recorded and used for advocacy and awareness-raising. This information shaped Isis-WICCE’s programmatic work for years to come, and recordings were shared among women in the community, transmitting stories and experiences even among women who could not meet face to face. What was the importance of Global Fund for Women’s support for Isis-WICCE? It is Global Fund for Women that filled the critical financial gap that many mainstream donors shied away from providing us. Global Fund for Women supported us because it is a true feminist organization. It has always looked where the missing gaps of enabling women to become human rights defenders in their own right. What other resources, besides funding, has Global Fund for Women provided? Global Fund for Women opened doors for us to engage at international and regional platforms and facilitated Isis‑WICCE to take our beneficiaries to places like the UN Commission on the Status of Women and the African Union, so that women could speak for themselves at important global events. They helped us raise our profile at important events, and I know very well that this enabled us to be identified as the only women-led organization in Uganda that has generated knowledge on women, peace, and security. In what ways did Global Fund for Women help you personally? Global Fund for Women helped me to grow. They let me navigate and find my own way of doing my work. That enabled me to become very innovative, because they were flexible. For me, all that I achieved comes from feminist funders like Global Fund for Women, who gave me the space to think, to become innovative, to connect and build my team in a way that helped to transform women the way they wanted to be transformed. As a girl growing up in Nepal, Rita Thapa was lucky enough to attend school—unlike many of her peers. However, she still witnessed and experienced the many ways that women were disadvantaged just because of their gender. “I knew that even though I came from privilege, I didn’t have the same status as men,” Rita says. As an adult, this awareness inspired Rita to start Tewa (meaning “support” in Nepali). Rita launched Tewa in 1995—the country’s first, and still only, women’s fund—in order to support grassroots women’s groups and raise their visibility in Nepal. Since then, Tewa has helped build and strengthen hundreds of grassroots women’s rights groups. But when Rita founded the organization, she did so with nothing more in her pocket than a single grant from Global Fund for Women. Rita says Global Fund for Women immediately believed in her vision of building women’s power and agency in Nepal, and backed up this belief by giving her the funding she needed in order to move Tewa from idea to reality. “Global Fund for Women told me ‘Rita, you could really do this. We’ll send you some money right away.’ And they did,” Rita says. 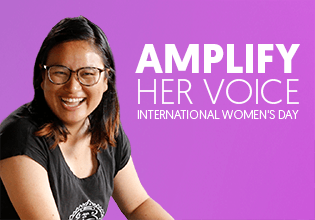 Global Fund for Women stood by Rita every step of the way as she raised the profile of Tewa internationally and within Nepal, connecting her with donors and activists across the globe. Global Fund for Women’s support extended far beyond Tewa’s early days, and continues today. When a 7.8-magnitude earthquake hit Nepal in 2015, thousands of Nepali women and men were left injured, homeless, and in dire need of help. Global Fund for Women immediately began a crisis fund for Nepal and, from that, granted Tewa $70,000 in order to support the immediate needs of women and girls following the earthquake and to help in long-term recovery. “The support came from all over, without us asking for it. Global Fund for Women had a big role in that,” says Rita. As the country continues to rebuild after the earthquake, Tewa has played a key role in supporting vulnerable communities and addressing the unique needs of women and children. How is Global Fund for Women’s support different from other groups? Development aid at the time [that Tewa was founded] was very politicized. Women got pittance support from the aid, and whatever aid went for development here in Nepal went mostly to men-led organizations. The trust [from Global Fund for Women] was the most valuable. It was everything: the moral support, the community, the funds, and then knowing that the funds would come, if not directly from Global Fund for Women, then through the network of people I met through Global Fund for Women. What else was valuable about Global Fund for Women’s support? We [in Nepal] know the politics of development aid. But Global Fund for Women never made it cumbersome for us. The value of Global Fund for Women has been in intellectual relationship-building, and in its reflection of feminist values and principles. It’s not just about what we do, but about how we do our work and how we build real relationships. How has Global Fund for Women affected your work? These are people that I respected and loved, and therefore their issues became mine as well. It’s been a very, very inward journey. I don’t believe that we can do good work on the outside without changing from the inside. I think, had I not met these people, I don’t think my life would have been as rich or my work as deep. Global Fund for Women has a long history of supporting women who are disrupting the status quo and building powerful social movements for women’s rights. From creating secret schools for girls in Afghanistan to launching the first-ever women’s fund in Mexico to get more money to grassroots women’s groups, meet five bold women driving real change in their communities, countries, and around the world. Five disruptors taking risks for bigger gains for women’s human rights. At the core of each of these case studies is a fundamental principle that inspired Global Fund for Women’s founders that continues to drive our work today: trusting grassroots women leaders to innovate and to do what’s best for their own communities. With trust, partnership, and funding, Global Fund for Women enabled the five groups spotlighted in Disruptors to create meaningful and lasting change for women’s human rights. Share these powerful stories of #Disruptors and join the conversation. What are your ideas for bigger gains for gender equality? Checkout our action toolkit for 8 ways you can help make a difference now for women’s rights. Donate to help more innovative ideas, solutions, and possibilities from grassroots women’s groups grow and make an impact. Use this action toolkit to learn how YOU can make a difference now to be a champion for equality. We’re committed to working tirelessly to help women and girls have the equal human rights they’re entitled to. We believe in the power of women to change their own lives, their communities, and the world for the better. We need people like you to join our community of champions to help us get resources and attention to bold and innovative ideas and solutions for women’s rights, like those featured in #Disruptors. With your help, we can empower grassroots groups and movements to create real and lasting change for women and girls everywhere.